Sometimes I eat them with just buttery goodness oozing into all the little holes in their golden toasted interiors. Or simply spread them with a luscious layer of homemade cream cheese. Occasionally I will throw caution to the wind and slather a spoonful of blackberry jelly across their little nooks and crannies. And when I’m in a particularly wild mood, I will add an egg, a piece of homemade cheddar cheese, and either bacon or sausage. Just call me wild and crazy! But no matter how I choose to “dress” them, they are most thoroughly enjoyed. 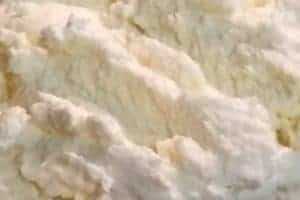 As you can imagine, I worked diligently to come up with my own recipe for these little beauties as soon as my sourdough starter could be called “started”. And that’s a cryin shame. 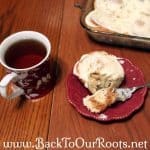 They are probably my most popular baked good among my friends and family and I get many requests for them. 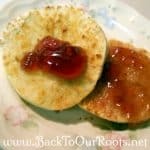 In the interests of others of you helping to supply the general populous with the ultimate sourdough English muffin, that will spoil them for store-bought ones, I am sharing my recipe with you here. 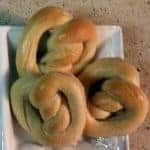 These work best with starter that has been fed within the past eight to twelve hours, although they will be fine if it hasn’t been if you are using the yeast added method, they just won’t rise as high. You have to use a recently fed starter if you are using the traditional method. t’s almost identical except for the rising times. Just keep in mind that they will be an over night process. In a large mixing bowl, dissolve the honey in the warm water. Stir in and dissolve the yeast, and then mix in the sourdough starter and 1 cup of flour. Let this sit for a few minutes, until the mixture begins to bubble. Add the dry milk, butter, salt, and a second cup of flour, and beat well. Turn the dough out onto a lightly floured surface and knead it until it’s smooth and springy, but slightly on the slack side, about 8 minutes. This dough is supposed to be slightly sticky. Add flour only as necessary to prevent sticking. Punch down dough, turn it out onto a lightly floured work surface, cover it and let it sit for a few minutes. Divide the dough into two pieces and roll each piece out separately to a 1/2-inch thickness. Cut the dough into rounds; re-roll and cut any remaining scraps. 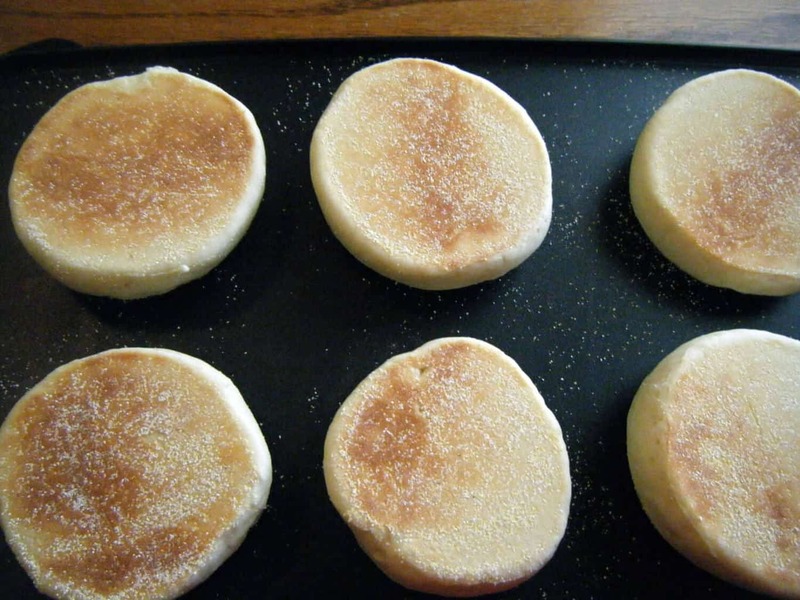 I use a large ring to cut my English muffins that makes them larger than the ones you would get at the store. I like them to be big enough for a large sausage patty and an egg. My cutter makes 24. The number you get will be dependent on how big your cutter is. Place the rounds onto cornmeal or semolina-sprinkled baking sheets, sprinkle them with additional cornmeal or semolina, cover with a damp towel, and let them rise until light and puffy, about 1 hour. 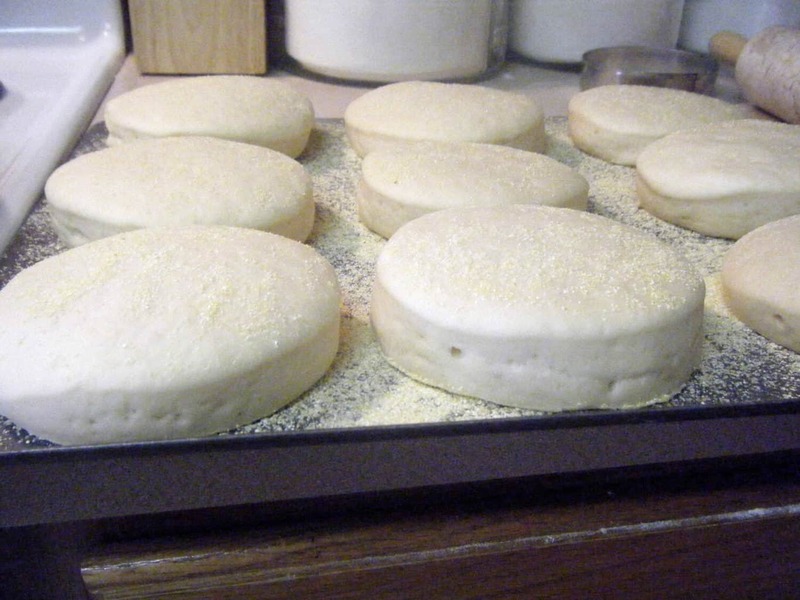 English Muffins Rising…sounds like a movie title. I’d watch it! Transfer the rounds to an electric griddle preheated to 275°F. If you don’t have an electric griddle, you can use a non-electric one on your stove top, or you can use a big skillet on the stove top. Cook for 10 to 12 minutes on each side, or until an instant-read thermometer inserted in the center of a muffin registers 190°F. Remove them from the griddle and cool on a rack. You may have to play with your griddle to find the right temperature for the muffins. They need to be nicely browned and crispy on the bottoms before you flip them. If they cook faster then 10 minutes, you need to lower the temperature to make sure that they cook all the way through. 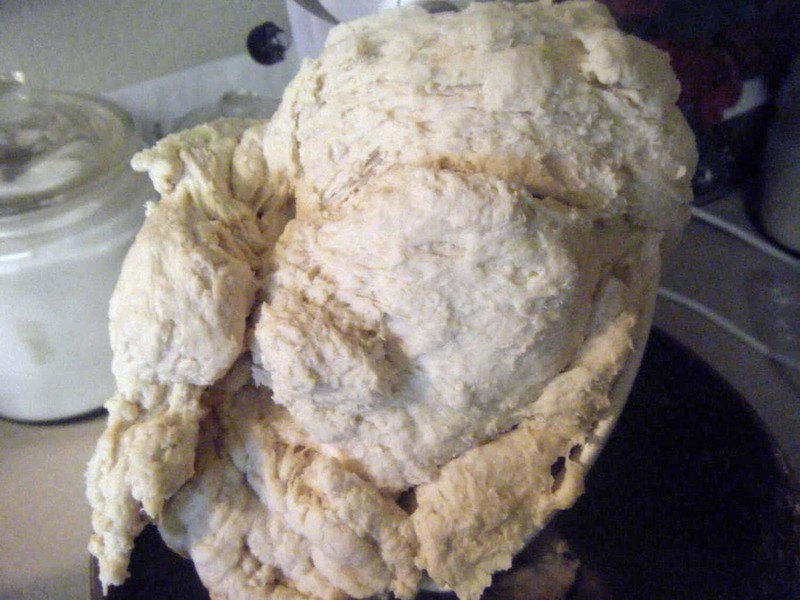 This version does not use yeast and is the traditional sourdough method. Dissolve the honey in the warm water. Add 2 cups of flour and the rest of the ingredients and mix well. Continue adding flour a cup at a time to form a dough that holds together and pulls away from the sides of the bowl. 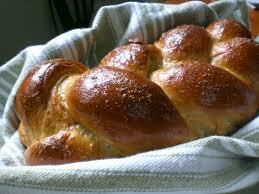 Cover the dough with plastic wrap or a damp towel, let it stand until it has doubled in size. 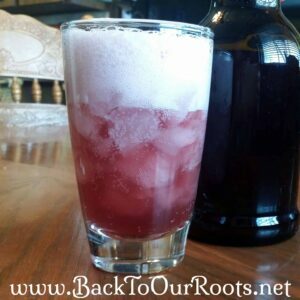 Depending on the warmth of your kitchen this will take anywhere from 8 to 12 hours, or overnight. Place the rounds onto cornmeal- or semolina-sprinkled baking sheets, sprinkle them with additional cornmeal or semolina, cover with a damp towel, and let them rise until light and puffy. Now again, depending on the warmth of your kitchen, this could take anywhere from 4 to 8 hours. Transfer the rounds to an electric griddle preheated to 275°F. Cook for 10 to 12 minutes on each side, or until an instant-read thermometer inserted in the center of a muffin registers 190°F. Either way you make these, they are really good. I would recommend one at least once a day. These are also really good for sandwiches at lunchtime or a late night snack. They are basically just pretty good at any time! 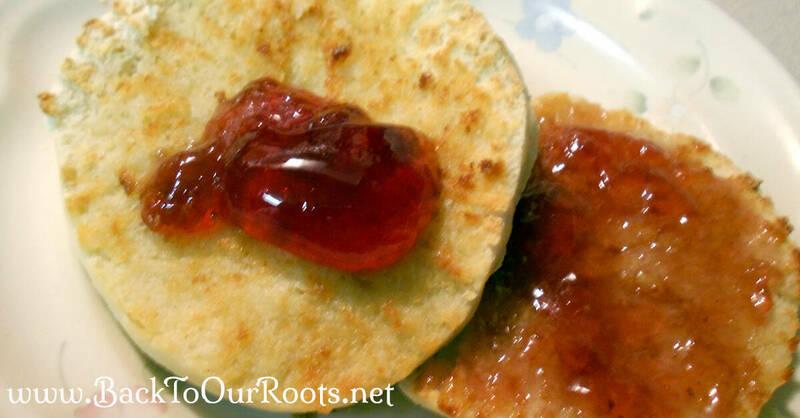 There is nothing I love more to pair with my morning cup of tea than a fresh sourdough English muffin. In a large mixing bowl, dissolve the honey in the warm water. 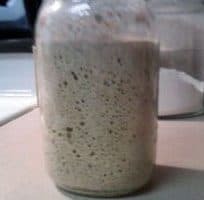 Stir in and dissolve the yeast, and then mix in the sourdough starter and 1 cup of flour. Let this sit for a few minutes, until the mixture begins to bubble. Turn the dough out onto a lightly floured surface and knead it until it's smooth and springy, but slightly on the slack side, about 8 minutes. This dough is supposed to be slightly sticky. Add flour only as necessary to prevent sticking. Clean out and grease your bowl and place the dough in the greased bowl, turning it so that a thin film of oil coats all sides. 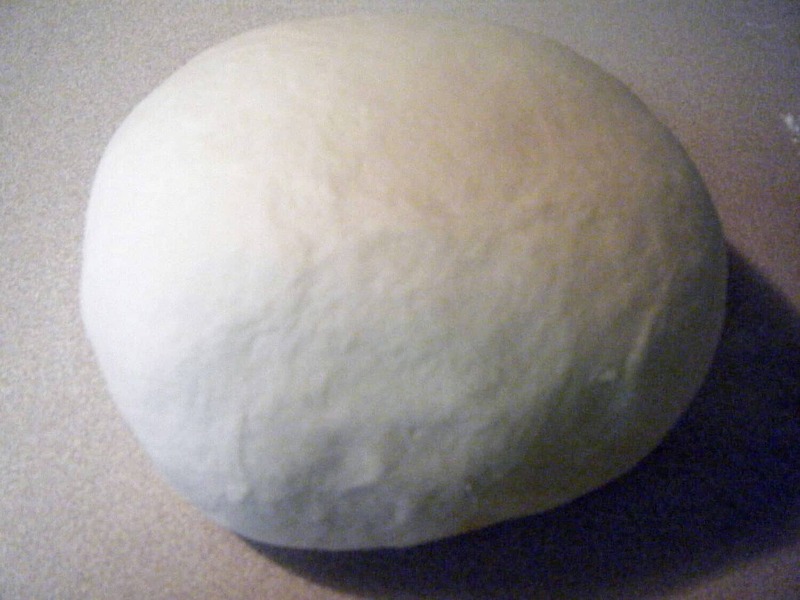 Cover the dough with plastic wrap or a damp towel, let it stand until it has doubled in size, 1 to 1 1/2 hours. Transfer the rounds to an electric griddle preheated to 275°F or a big skillet on the stove top. Add 2 cups of flour and the rest of the ingredients and mix well. Turn the dough out onto a lightly floured surface and knead it until it's smooth and springy, but slightly on the slack side, about 8 minutes. Clean out and grease your bowl and place the dough in the greased bowl, turning it so that a thin film of oil coats all sides. 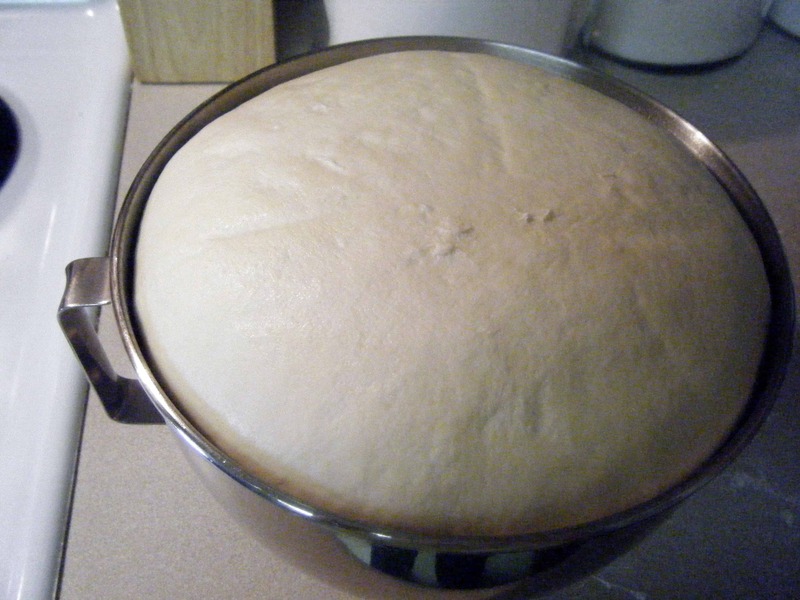 Cover the dough with plastic wrap or a damp towel, let it stand until it has doubled in size. Depending on the warmth of your kitchen this will take anywhere from 8 to 12 hours, or overnight. Cut the dough into rounds; re-roll and cut any remaining scraps. Place the rounds onto cornmeal- or semolina-sprinkled baking sheets, sprinkle them with additional cornmeal or semolina, cover with a damp towel, and let them rise until light and puffy. This could take anywhere from 4 to 8 hours. Transfer the rounds to an electric griddle preheated to 275°F or a large skillet on the stove top. Either way you make these, they are really good. I would recommend one at least once a day. These are also really good for sandwiches at lunchtime or a late night snack. They are basically just pretty good at any time!